Are you an NGO, lawyer, business, or consultant working in Libya? Would it be useful to have an expert Libyan Arabic translator “on call” seven days a week to work on your urgent projects? Industry Arabic has worked extensively in Libya and translated thousands of pages of legal documents, media analysis, Powerpoint slides, and governance-related materials. This article outlines our team’s experience and approach to working with Libyan Arabic and Modern Standard Arabic (MSA) in the Libyan context. Since ancient times, the region now known as Libya has played a significant role in Arab and international history. This oil-rich nation emerged as one of the greatest leaders in the African Union and Arab League during the modern era. Libya’s prominence fell due to the events of the Libyan Revolution in early 2011 and subsequent overthrow of the Jamahiriyya. Ever since, the country has been embroiled in a bitter civil war that has effectively split the country into three. Despite the conflicts and strife, Libya has remained at the center of attention for the international community. With the prospects of peace, reconciliation, and stability on the horizon, many look forward to interacting with Libya once again and supporting its reconstruction. For businesses and NGO’s concerned with Libya’s recovery, a familiarity with their particular dialect is crucial. Whether it comes to media analysis, political settlements, or business development proposals, Industry Arabic can help you understand the in’s and out’s of Libyan Arabic for your next project. Libyan Arabic itself is divided between three major regional variants: Western (based in Tripoli); Eastern (based in Benghazi); and Southern (based in Sahba). 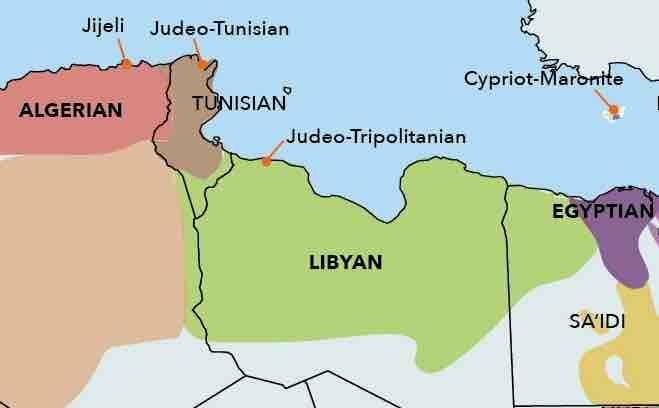 Located between Egypt, Algeria, and Tunisia, Libyan Arabic likewise represents a unique crossroads in terms of Arabic dialects. It is not so much related to Egyptian or Levantine Arabic as it is Maghrebi dialects. Yet, it cannot be entirely classified as Maghrebi either. In fact, the dialect is very close to Gulf Arabic, thanks to the mass migration of Arabian tribes to the region in classical times. As such, the dialect is close to Classical Arabic in terms of pronunciation and vocabulary. The only noticeable difference is the pronunciation of the qaaf (ق), which sounds more like a “g”. However, this is not always the case, as in the name of Libya’s former leader, Muammar Qaddafi/Gaddafi. The dialect also contains many foreign loanwords. Being the indigenous people of North Africa, the Berber language and culture is present in Libyan Arabic. Many Italian loan words have also made their way into Libyan Arabic due to that country’s colonization of Libya in the early 20th century. 100% Trusted Expert Human Translators: Machine translation (and human translators that rely on them) barely have a solid grip on Modern Standard Arabic. As such, their grasp over Arabic’s many dialects is even weaker. At Industry Arabic, every word we translate is done by professional, human translators. In this way, you know that someone who actually understands the language is working on your translation. Many of the translators specialize in a variety of sectors, such as technical, legal, and medical translation. Our linguists are distributed across many different time zones so you can rest assured knowing that your time-sensitive project is ongoing, even while you sleep! Our company is ISO 17100 certified and we have an A+ rating from the Better Business Bureau. Libyan Specialist Linguists: Every translation goes through a two-step review process to verify accuracy and readability. For Libya Arabic projects, we entrust the process to a Libyan dialect specialist who has a deep understanding of Libya’s language and culture. After finishing the translation, the translator edits their work against the source text. Then, they submit the document to our project managers, who proofread it and ensure that it is ready for delivery. In this way, we can guarantee that multiple eyes and hands have reviewed your project and crafted it to suit your stylistic needs. A Love for the Libyan Language! We love to take on dialect projects, and Libyan Arabic is no different. We take on all kinds of translation work in the Libyan dialect, whether simple written reports, legal documents or multimedia projects. Our translators are well-equipped and technically savvy in using the best techniques and industry programs while working on your project. Political Reconciliation Process: We have worked closely with several international NGOs to support Libya’s transition process. The project has involved conference minutes from different Libyan town hall meetings, video transcription in the Libyan dialect, and political proposals for building a new government. Libya Laws Project: Industry Arabic translated a series of laws enacted in Libya for a legal case. the project not only required deep knowledge of legal translation, but also an intimate understanding of Libyan society and politics. Arabic Handwritten Evidence Documents: We have translated dozens of pages of handwritten evidence materials in the Libyan dialect. Our team deciphered nearly all the text in record time, despite the files’ poor handwriting and scan quality. Let our team of qualified translators deliver the results you deserve according to your schedule. Just click here to receive your quick, accurate, and free quote today!